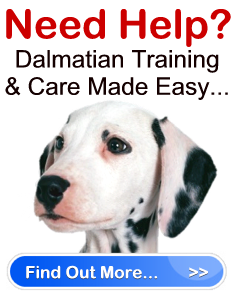 Dalmatian Training – Teaching Your Dog Not To Jump Up " "
Like all obedience training, Dalmatian training is about teaching your dog who’s in control and how to behave. That being said, it is a good idea to take your Dalmatian to obedience classes so he can be properly trained and you can learn how to effectively command your dog. However, aside from just standard obedience Dalmatian obedience training, may require a few more behavioral lessons in regards to his hyperactivity. By nature, the Dalmatian is a very energetic breed, which means they like to jump up on things and on people. Although you may not mind that your Dalmatian jumps up on you, it is not something you will want him to do when greeting company or children. Dalmatians are heavy dogs that can weight up to 70 pounds. Imagine coming home from the grocery store and your arms are loaded down with bags, would you want your Dalmatian jumping up on you as soon as you walk in the door? Probably not. That is why it is imperative you put Dalmatian training into action when your dog is still a pup, to teach him that jumping up on people is unacceptable behavior. To help you teach your dog that jumping up is undesirable, the following are a few Dalmatian training tips you can put into practice to prevent your Dalmatian from forming a jumping habit. Tip 1 – The first aspect you need to understand is that your dog is jumping up because he wants to be close to you. Therefore, before your dog jumps up to greet you, make it a priority to kneel down on the floor so you are closer to your puppy’s level. This will allow him to greet you without jumping. If your dog tries to jump before you have the chance to kneel down and greet him, put Dalmatian training into affect by saying “No!” in a firm tone. Give him the command to sit and once he does, reward him with praise. Tip 2 – If the above method is not affective, or you would like to try something different, try this: When you enter your home and your dog attempts to jump on you, immediately turn your back to him. This action will likely confuse your pet and cause him to back off and wait for you to acknowledge him. When you face him, praise him only if he is sitting. Unfortunately, what will likely happen if you attempt this form of Dalmatian training is your dog will jump up as soon as you turn to face him. Therefore, you must be prepared to turn around each time. This can prove to be a long process and will require plenty of your patience. Furthermore, you should not reward your dog with a treat or praise when you turn around, unless he is sitting. It is imperative that your dog knows you are rewarding him for sitting, not for jumping up. Tip 3 – Another method you can try is to tie your dog to an immoveable object so his movement is limited. Once he is secure, walk away from him. When you are a good distance away, begin to walk back towards him. If your Dalmatian makes an attempt to run to you or jump up he won’t be able to. Moreover, as soon as you see your Dalmatian start to run or jump, stop moving towards him. Eventually this Dalmatian training will teach your dog that you will not come near him when he attempts to run or jump towards you. Finally, make sure your puppy knows all the basic dog commands (Come, Sit, Stay, Down) before you teach him not to jump up. That way you can utilize the obedience Dalmatian training to help you stop your dog from jumping. For instance, if your Dalmatian attempts to jump up, you can simply give him the “Down” or “Sit” command. When he performs the command praise him. Always use the same command each time he goes to jump and eventually he will learn to associate the command as his greeting to you. Regardless of the Dalmatian training method you use when teaching your dog not to jump up, it is important that you do not punish or hit your dog when he jumps up. This will only slow down the process of training your dog, and he won’t associate his jumping up with the punishment. His only thought is to greet you, he won’t understand if you punish him for saying hello.